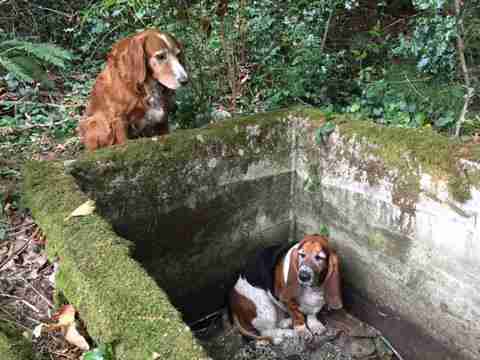 In a remarkable tale of love and loyalty between two pets, a trapped dog has been found alive a week after going missing - all thanks to the tireless dedication of her faithful friend who refused to leave her behind. 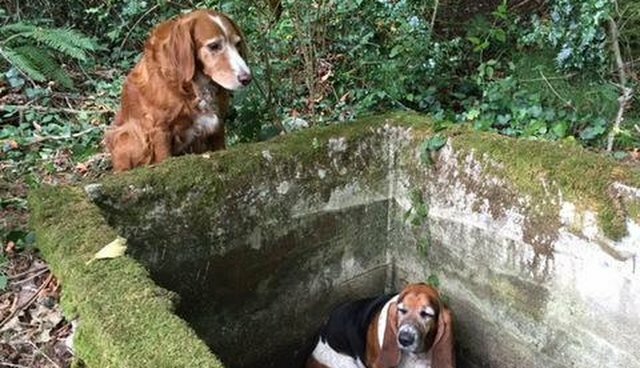 Earlier this month, Tillie the Irish setter-spaniel mix and Phoebe the basset hound had been out for a walk together where they live on the island of Vashon, Washington. 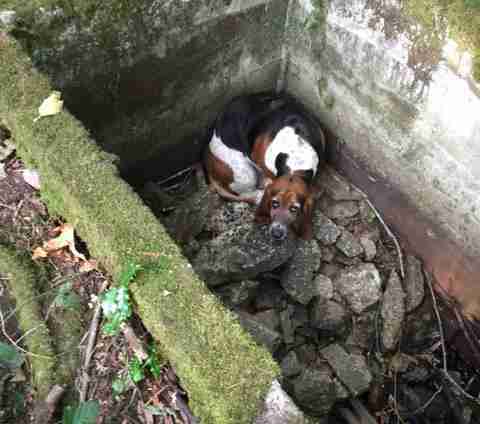 They failed to return home, and their worried owner started searching but couldn't find them. He contacted Amy Carey, a volunteer with Vashon Island Pet Protectors, for help. Day after day, they scoured the area for any sign of the two missing dogs, but their efforts were fruitless. Little did they know that Phoebe had fallen into a cistern deep in a remote ravine several miles away and was unable to climb back out. She would have surely died before being discovered if it weren't for what Tillie did next. "We had been out looking for about a week when we heard from a farmer here who noticed a reddish dog on his property," Carey told The Dodo. "She had quietly approached him, and when she got his attention, turned around and headed back toward this ravine nearby. I decided to go check it out." That's when Carey saw something that she'll never forget. "When I got there and looked down, Tillie saw me but didn't come running up," Carey said. "She just stayed near the edge of this cistern, pressed with her head as close as she could get. Had she run up, we might have never realized that Phoebe was down there. She just stayed put, making it so clear that I had to come to her so I would see her friend." Sure enough, there was Phoebe, exhausted after her long ordeal. "When I saw what was happening, tears were immediate. It was just so touching," she added. Although Tillie could have ventured off and found her way back home, she seemed to understand that if she left, Phoebe may very well never have been found. Instead, she endured a week in the outdoors where her friend was trapped, likely making forays in the surrounding area in hopes someone would follow her back to the spot. "We didn't know where they were going to be," Carey said. "They were miles away from the place they had been seen before. It was Tillie going very pointedly up to this person in their pasture, letting herself be seen, and running back to Phoebe - that's why we found them. It's really amazing." Incredibly, both dogs were in good health, avoiding dehydration thanks to a sprinkling of rain over the week that they were missing. No words were needed to see just how happy they were to have finally been found. "Once they got out, they were happy as clams. Tillie was so relieved. When the owner came to get them, they heard his voice in the distance, you could just see their relief. They just started wiggling," said Carey. 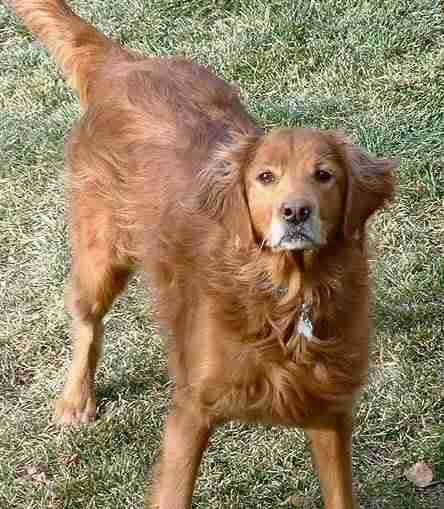 "It was very touching, but in a way not surprising given what we know about dogs as loyal friends. We were just so very grateful to find them safe." Unfortunately, not all communities are lucky to have organizations like Vashon Island Pet Protectors to help in the search for lost pets. For information on what to do if your dog or cat goes missing, check out the Humane Society of the United State's helpful guide.